Last month's Mega Man mosaic of painted cups in a chain-link fence has a sequel, and an artist claiming responsibility for the acts of awesomeness. Here is Samus and a metroid by Pixeled Fence, "a gamer's urban art project." 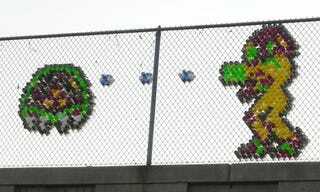 It and the Mega Man mosaic appeared on the Carterville Road overpass of University Avenue in Provo, Utah. This project took 670 cups, nine cans of spray paint, and about two hours of setup time. You can see more images at the link.